The Tampa Bay region’s freight transportation network is a valuable resource for the promotion of commerce, the creation of jobs, and the improvement in the quality of life of our residents. 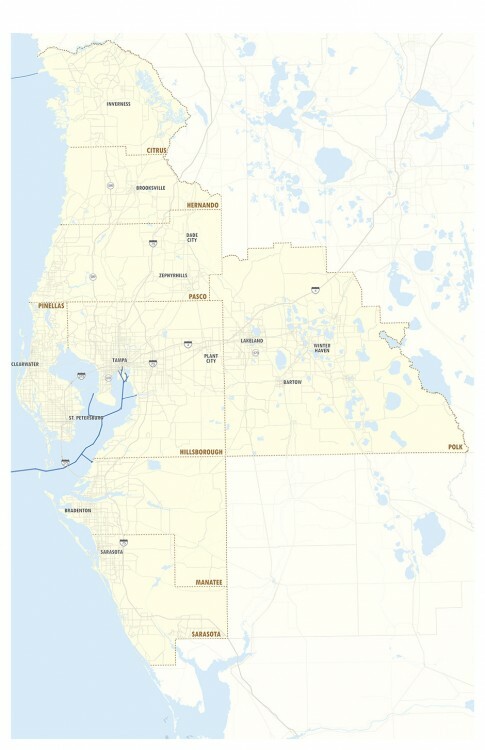 Tampa Bay’s freight transportation system includes regional freight activity centers (FACs) and the freight transportation network that connects FACs to each other and to markets across the state, country, and world. Freight activity centers have been identified throughout the Tampa Bay region to provide context for where industrial and freight logistics activity is heaviest and to define strategies for preserving and improving mobility on the transportation corridors that serve them. The freight transportation network provides for the mobility of the broad range of goods traveling through the Tampa Bay region. The hierarchy of the regional freight roadway network includes limited access facilities, regional freight mobility corridors, freight distribution routes, and freight activity center streets. 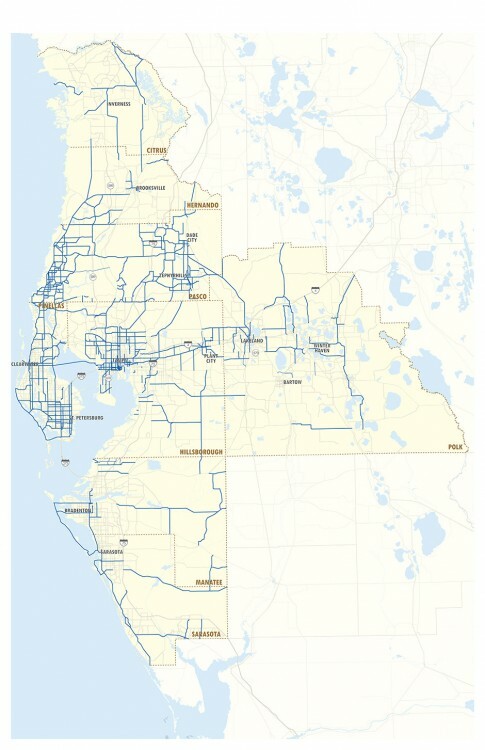 Limited Access Facilities provide uninterrupted flows for high volumes of traffic and serve as primary trade corridors connecting the Tampa Bay region to the rest of the state and country. The limited access facilities are part of the Strategic Intermodal System and include all Interstate highways and tolled roadways within FDOT District Seven. These facilities include I-4, I-75, I-275, and I-375 as well as the Selmon Expressway, Selmon-Interstate 4 Connector, Veterans Expressway and Suncoast Parkway. 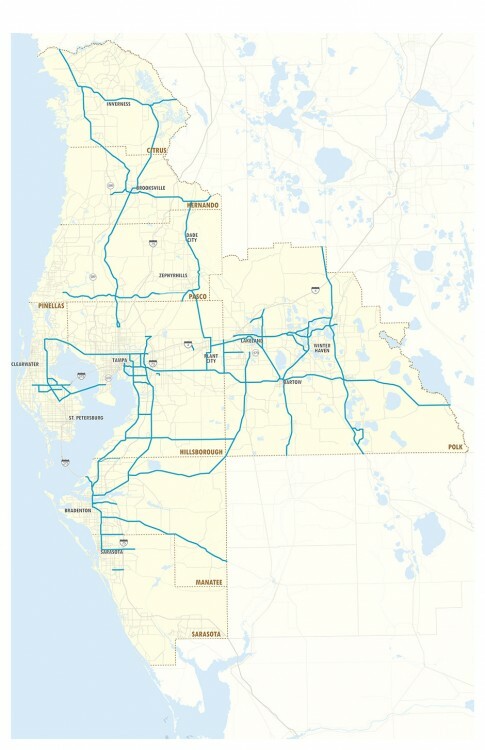 These roadways are the primary trade corridors for trucks and connect the Tampa Bay region with the rest of Florida as well as the United States. They also serve as major commuter corridors. Preserving capacity and maintaining safe, high speed travel conditions for trucks and commuters is a primary objective for improvement strategies employed in these corridors. Regional Freight Mobility Corridors provide high capacity connections between limited access facilities and regional freight activity centers. These facilities also serve regional through movements for long-haul truck trips and host high volumes of truck traffic. Regional freight mobility corridors are a vital part of the freight roadway network and have a secondary role of distributing freight to commercial and other local destinations. Some of the regional freight mobility corridors are part of the Strategic Intermodal System. All of the regional freight mobility corridors in the Tampa Bay region also serve as important corridors for commuters traveling to major employment centers. Freight Distribution Routes include state roadways and other local roadways designated in local truck route ordinances at the county and municipal levels. Freight distribution routes serve to distribute truck traffic to local delivery areas. The freight distribution routes provide an adequate network for trucks to deliver goods, while also minimizing truck traffic on other local roads within populated areas. By law, trucks must remain on freight distribution routes until they reach the closest point to their final destination before turning on to local streets for delivery. Freight Activity Center Streets are publicly owned/maintained roadways that provide direct connections to freight activity centers (FACs) from freight distribution routes and/or regional freight mobility corridors. FAC streets also provide internal circulation within freight activity centers. Ultimately, trucks must use the local FAC streets to access the region’s FACs, making them an important “last mile” component of the freight network. Truck Rest Areas within the Tampa Bay region, both public and private, are another important component of the freight roadway network. Truck rest areas play a crucial role in the Hours of Service limits placed on truck drivers by providing safe and convenient locations for truckers to rest. In general, the Federal Motor Carrier Safety Administration Hours of Service rule for truck drivers stipulates an 11-hour daily driving limit and a 14-hour work day limit. Other parts of the freight movement system include shipping channels, which provide the primary means of exporting large quantities of goods overseas; railroads, which provide an efficient mode for transporting containerized, bulk, and break bulk cargoes regionally, statewide and nationally; air freight, allowing for the quick transport of time-sensitive goods over long distances; and pipelines that provide efficient, cost-effective transportation of imported fuels to major users.